The selection of a celebrant is one of the most important decisions a couple will make when planning a wedding. A celebrant will set the tone for your future married life together, in front of your wedding guests including friends and family. As with marriage itself, the process of choosing a wedding celebrant is best not entered into lightly. If you consider these top five tips, your once-in-a-lifetime ceremony will surely set a positive, heart-warming and uniquely personal tone for this new journey together. You have one chance, so getting it right is critical! 1. Make a list of the celebrants who preside in your area or destination. If you are like most people and searching without many leads, you might start by Googling the keywords “celebrant” along with your “location-name” to generate a list of possible matches. In reading the content on websites, try to determine which celebrant offers a ceremony (be it civil, spiritual, or religious) that aligns with your relationship values. Do any appear to fit your budget and personalities as well? Notice what past couples have commented about on Facebook Reviews, Google Business Listing Reviews or consider old-fashioned word-of-mouth testimonials. Finally consider whether the officiant is legally empowered, if that is a consideration. Once you shortlist one or two selections, proceed to the next tip. 2. Tell them your dreams and judge their responses to questions. Either meet in person, by phone call, or set up a Skype call with the celebrant. If this is not possible, then at least send an inquiry by email before making your decision. You might ask for the celebrant’s standard/sample ceremony script, or his or her typical procedures for working with couples. Considering the response, ask yourselves whether the celebrant seems willing to spend time with you (which often includes a fee for his or her time). Also observe the Celebrant’s overall demeanour in a phone or Skype call, or by the tone of emails; will this individual seem likely to help you loosen up and stay calm and comfortable on your special day? 3. Decide if you want a typical ceremony, a creative ceremony, or something in-between. More and more celebrants are responding to a couple’s request to provide humour in ceremonies. The theme of your ceremony should, however, not be too forced. A good Celebrant will help avoid being too timid or grandiose, and will strive to authentically represent who you are. It is best to have your words and the ceremony itself reflect your personalities. If you are serious about style, then it is recommended to consider your Celebrant’s appearance, particularly his or her attire. A celebrant who really pays attention to details, can dress according to the theme of your choice. It is OK to ask the Celebrant to dress formal or dress casually for the ceremony. 4. Look for a celebrant who will advise you on the elements of your ceremony. Decide if you would like to write some or all of your own vows. Ask your potential celebrant for advice or resources around vows. This is extremely important, because vows are the centerpiece of a ceremony. They should authentically reflect your personalities and pledged commitment to each other. Traditionally, couples promise devotion beyond circumstances (rich or poor, sickness or health, good times or bad). A good piece of advice is to make vows personal and humorous by commenting on both the seemingly mundane or ordinary aspects of a relationship, e.g. “I promise to keep our house in order, including keeping your closet organized for you” as well as important matters in the commitment, such as, “I promise to love you forever, and make many babies together.” An attentive and caring celebrant will also encourage you to choose devotional poetry for use in the ceremony, and might offer to ask other family members to be involved. This adds yet another layer of personal touches to the event. It is important to note that not all celebrants will offer to help you organize such matters, so if these aspects are important to you, choose your celebrant wisely. Also consider whether you would like to do some ritual, such as mixing the sands, tying the knot, pouring water over flowers, etc... There are many rituals which can add a fabulous layer of uniqueness and tactile experience to your ceremony. 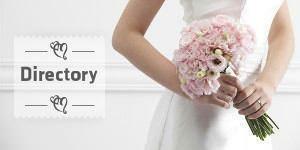 As a bonus, you can typically keep the ritual items as a sacred memento of your special day. 5. Get assurance that the Celebrant is willing and eager to personally tell your story. Tell your celebrant about how you and your fiancé met, ask if this story might be told in the ceremony. Many couples enjoy including a funny anecdote about their first encounter, or other stories such as the one about how the bride’s dog first responded when meeting the future groom. What strange things happened on your first date? When and how did you know he or she was “the one”? The celebrant may ask you to put these kinds of details in writing so he or she can accurately re-tell the story for your guests. Finally, a momentous ceremony will often have an element of surprise. If you would like this, then ask your potential celebrant for ideas! In summary, try to choose a celebrant who resonates with you emotionally, and provides you the attention you deserve. The celebrant should clearly emote love and passion for the work, and be enthusiastic about personalizing the ceremony to meet all your expectations. You deserve a celebrant with a supportive and responsive attitude; someone whose presence inspires deep respect and happiness for you as a couple, and someone who will set a beautiful tone for a wonderful future life together. 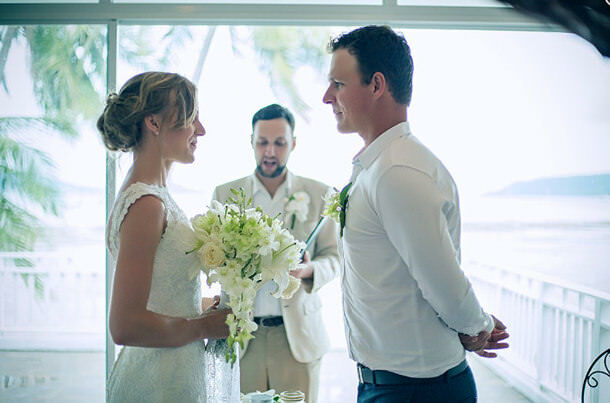 Originally from the USA, Jacob has worked as a Wedding Celebrant and Master of Ceremonies for luxury resorts, beaches, yachts and private islands located in and around Thailand since 2008. "It is my greatest honour to support you in creating a tailored event, which resonates in your heart with love, joy & devotional meaning." Having worked closely with the top wedding planners and resorts, Jacob is happy to help couples organize all elements of their event in cooperation with leading partners. He is based in Phuket where he lives with his wife, baby daughter and Siamese cat. 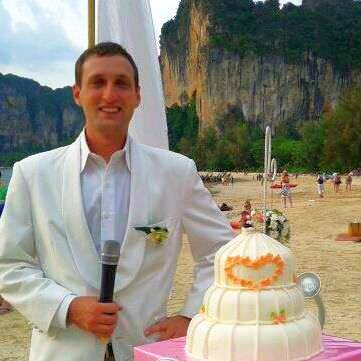 Find out more about Jacob on his website - www.CelebrantPhuket.com or check out Phuket Wedding Celebrant at Destination Wedding Directory.